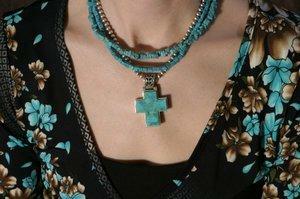 Turquoise wheel beads are a staple in Native American jewelry. Come learn how they are made, and then look at some examples of the beautiful pieces created with them. How are Turquoise Wheel Beads Made? As with wheel beads made from shells and other gemstones, the process of making turquoise wheel beads is actually a very ancient practice. Even the advent of modern tools and machinery hasn't done much to alter this tradition passed on from one generation to the next. To begin, the raw turquoise is sliced into the width of choice and then cut into crude squares with a nipper, the same sort of tool used to clip contours in ceramic tiles. Once each square is made, the bead maker drills a tiny hole through what is roughly the center of the shape. Each rough-hewn bead is then strung together with hundreds of others in anticipation of the grinding process. Grinding the edges off the beads is actually a tedious process. The entire string is held against a grinding wheel, typically made today from silicone carbide material and electrically powered. The bead maker gently holds the string of beads against the turning stone and allows it to begin chipping away at the outermost edges. Just how much the beads will be worn down depends on the bead maker's goal. Some bead strings are left semi-rough for a more rustic look, while others will be ground off to a smoother, more rounded look. Although this may not sound quite so difficult, the process is made more challenging by the fact that many beads will break away from the string during the grinding process. This is because part of the charm of turquoise is the impurities in the stone that give it character. Some of these materials are quite hard and resistant to grinding. When the grinder hits a burr of this type, it tends to break the softer surrounding turquoise material, ruining the bead for further use. Once a decent circular shape has been established, the beads will be ground to a more refined shape using a series of finer grade sanders. The string is finished off by polishing the beads' surface using wax and an automated leather polishing belt. Grinding time and bead loss is largely dependent on the type of turquoise being used. Natural turquoise tends to break easier, and so as much as 75% of the rough beads may be lost during grinding. To counter this problem, bead makers will usually spend more time clipping the raw turquoise into a rounder shape before stringing and grinding.On the other hand, stabilized turquoise is a much stronger material than the mineral is in its natural state, and this allows the beads to be ground down far more smoothly at a significantly lower rate of loss. Heishi is the traditional name for Native American beaded jewelry. The classic Heishi necklace or bracelet is made from one or more strings of nearly flawless beads that have been sorted from the ground and polished strings. In order to judge the true quality and value of any Heishi piece, you need to feel the beads with your hands. Run the string through your fingers. Do the beads feel rough? Do they catch slightly as they pass through your finger tips? Or, do they feel completely smooth, as though they are a single unit? This perfect smoothness is a sign of the finest quality piece, and results from the bead maker's skill in grinding the beads evenly so the center holes remain uniform in size. Although there is no doubt that the quality of a particular set of beaded jewelry justifies the price tag, there's nothing wrong with purchasing a lesser piece. Some people actually prefer the rustic look of a rougher set, so jewelry makers design necklaces and other accessories with these tastes in mind. To appreciate the craftsmanship that goes into this beaded jewelry, you really need to see some pieces for yourself.